P1: Upon a television screen in the wizard's laboratory, John Carter watched the ships of distant Helium sail forth in search of the lost princess. P2: Carter lifted Dejah Thoris into a glass cabinet. "A princess of stone will bring no ransom, Vovo -- so revive her, ere it is too late!" P3: "I am tempted to keep her and forget the ransom," Vovo exclaimed excitedly, "She is really suited for another of my greatest experiments!" P4: Vovo's eyes feasted on the beauty of the stricken girl -- her face was like a frozen mask of ersite stone! P5: Meanwhile, in the shadow of an archway, Oman, the mechanical man, silently watched his master. P6: He saw John Carter's sword point nudge Vovo's ribs. The little dwarf drew away in surprise and anger. P7: "Your genius will be short-lived, Vovo, unless you revive this girl, and do it quickly!" Carter snapped. P8: But Vovo shouted into his microphone and Oman came forth, leading other mechanical men to his master's aid. 1. In the novelization, some attention should be paid to John Carter's reaction to seeing televised motion pictures for the first time. He left Earth just after the Civil War in the United States, at a time when such advanced inventions were still unthinkable. 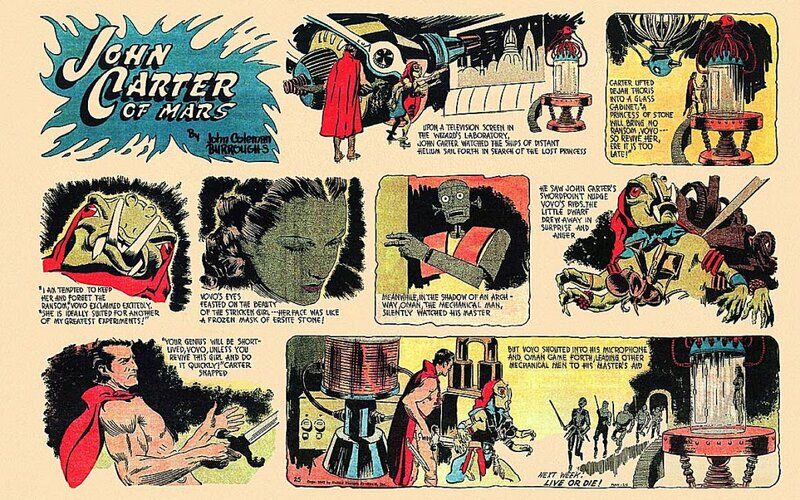 On Barsoom he had probably already heard Dejah Thoris speak of the shortwave radio used on some Heliumite fliers, but Vovo's television demonstration would be Carter's first exposure to wireless communication. In his mind he might compare it to the telegraph or the photograph, both of which he had seen back on Earth before his "death" in Arizona. Already, in the 1860s, some innovative telegraph operators had found ways to convey the rudiments of graphics through their transmissions of Morse code -- Carter might comprehend television as being a sort of wireless telegraph that could quickly transmit sequences of pictures over great distances. Certainly he would see the possible military applications for such a device and that awareness might give him a grudging respect for the technical abilities of the little green man. 2. In the novelization, Vovo will struggle mentally between his plan to ransom Dejah Thoris and his desire to inflict an even greater revenge upon the royal family of Helium -- whom he holds responsible for his not having been recognized as a great scientist, even when under the tutelage of Vo Dor at his lab in the basements of Greater Helium. Finally Vovo decideds to try and decalcify the princess -- not in order to just hold her for ransom, but to experiment upon her body and then to exchange the deformed girl with Helium for greater wealth and power. 2. Oman arrives upon the scene and hears Vovo reveal his sinister plans for the princess. In the novelization Oman's memory is beginning to return at this point, and he recalls the little dwarf reprogramming all his mechanical slaves with instructions to obey his orders, no matter the consequences to others. All of this deceit and destructiveness goes against the mindset originally given the robot by the old Wizards of Eo. Oman is torn with doubts about the advisability of continuing to obey Vovo's sordid commands. Still, Oman obeys when Vovo orders the robots to defend him against the armed John Carter. 3. At this point in the novelization, Vovo can be pictured as trying to enlist Carter to his mad cause. The wizard remarks that Carter is obviously a skilled warrior and an experienced leader of men. He says that his future plans include sending an army of unstoppable robots out to conquer to warring, disunited city-states of Barsoom, one by one, and that he needs a trusted general to lead his mechanical armies. Vovo offers John Carter a position at his side, telling the Earthman that Dejah Thoris will reject Carter's affection, once she has been returned to her own country -- that the royal family of Helium is a snobbish, unmerciful band of villains who will, no doubt, imprison the intruding outsider. For a moment John Carter half believes the lying Vovo, but then his sense of honor gains the ascendancy over his uncertainty and he tells Vovo that he has pledged to return the girl to Helium and will carry out that vow, no matter what happens to him. Vovo is obviously unhappy with Carter's rejection of his wonderful offer, but he mutters, "Perhaps there is another way for me to gain your cooperation and your loyalty -- totally." In saying this, Vovo is foreshadowing the purpose of his "greatest experiment," an episode that begins shortly after Carter rebuffs the proposal that he become the wizard's commanding general. CHAPTER 25: "GENIUS OR MADMAN?" Vovo turned off the television screen and joined John Carter at the table where Dejah Thoris had been laid out upon her back, like an overturned statue. Just then Oman returned and the three of them inspected the unfortunate girl. "I care not how much Helium pays you, Vovo, but a princess of stone will bring you no ransom at all," Carter said sternly. "So revive her, ere it is too late!" "All in due course, Jasoomian, all in due course. First it would be best for me to test the procedure, don't you agree? I have done this sort of thing before, but the results vary. If I am not careful I might remove the calcification successfully, but she still might not regain consciousness. Or she might die in the process. Let us first test my healing powers on your own arms and hands. You will soon lose them -- you know that -- if I do not treat them now. What say you, impatient warrior?" John Carter agreed that Vovo's plan was the best way to proceed and he consented to climb upon a second slab, which Oman pushed up beside the table bearing Dejah Thoris. Vovo explained the procedure. With John Carter lying flat on his back, the wizard would inject a certain medicine into each arm and then subject them to the glowing beam from a strange machine. If all worked well, the Earthman's hands would return to normal in a matter of minutes. "Let's get this over with," remarked the Virginian. "The night is far spent and so far I have heard nothing from you but talk,"
But before he could say another word the drug began to take effect. As though in a dream John Carter watched the green dwarf and his mechanical assistant train the warm rays upon first one of his arms and then the other. A few minutes passed. He struggled to remain conscious. Before long he felt the strength returning to his wrists and fingers. He tried to raise his head but a cold dizziness held him back. So he raised his arms instead. The color was beginning to return to them. His fingers moved easily now. Vovo's eyes feasted on the beauty of the stricken girl -- her face was like a frozen mask of ersite. But the wizard seemed certain now that he could revive the sleeping beauty. He and Oman moved the ray machine over to her slab. "I am tempted to keep her and forget the ransom," Vovo muttered. "She is really well suited for another of my greatest experiments!" "You'll keep your promise, little man." Captain Carter cried out. "Ransom or no, work the same magic upon her that you did upon me. No experiments! No tricks!. Bring her back to life and be quick about it!" John Carter had recovered fully. The only side effect he felt was the cold dizziness, but he fought off the dreamy feeling and urged Vovo to proceed. When the dwarf did not speed up his movements, the Earthman drew his long-sword and nudged Vovo's ribs with its sharp point. "Your genius will be short-lived, little green man, unless you revive this afflicted girl, and do it quickly!" Carter snapped. "Why, you ungrateful wretch!" shouted the little man. "You dare pull your sword on me, in my own home! Lower your blade or I'll have both you and your princess ground to dust and scattered to the winds!" Vovo spoke a word into his microphone and Oman came forth, pointing a loaded pistol at Captain Carter. At the same moment a dozen more armed mechanical men appeared, as if out of thin air. Carter did not lower his sword, but neither did he thrust it into the one person who might save the Princess of Helium. He, the dwarf, Oman and the throng of robots all stood watching each other, with none of them moving a muscle. It was Vovo who spoke first. "You call yourself, Dotar Sojat, don't you, Jasoomian? It is a fine Thark name and you are, no doubt, a fine warrior. You have commanded men; that I can tell. I admire your courage. You draw your sword against overwhelming odds and not a glimmer of fear enters your eyes. I like that in a man. Why do you think that the experiment I spoke of would be of any harm? It is not in my best interests to hurt either one of you. The procedure to revive the girl can begin just as soon as you put down that blade." The Earthman listened, but did not move his weapon. "Call me whatever name suits you. I know treachery when I hear it. So long as this sword is in your ribs you stand at death's door, no matter how many radium guns your tin men may point at me. Give me your word that you will revive the princess and allow her speedy and safe return to Helium. Only then will I consider letting you live!" "Spoken like a true soldier!" Vovo laughed. "Why of course you have my promise. In fact, I will make you a better one, Dotar Sojat. Once the girl has recovered and is on her way home, remain here with me. I will soon finish assembling another 10,000 mechanical men. With sufficient payment and resources from Helium, I can make 20,000 of the flying thoats within two years. I shall need a second odwar to lead the new cavalry division. Take a place in my army equal to Oman and enjoy a long life in your chosen profession, fighting man. I know these Heliumite ingrates. Once they have their daughter back they will throw you into a prison cell and you will rot there. Some dandy of a prince will marry her and she will forget you ever existed. Think it over, Dotar Sojat -- it is the opportunity of a lifetime!" John Carter was having difficulty maintaining his balance. The room seemed to be turning in circles around him. Where once had seen a dozen armed robots, now there were but six. Oman had put away the pistol and held only a short sword. The Virginian felt that at any moment he might close his eyes, never to open them again, but still he did not lower his blade. "Perhaps what you say is true, Wizard of Eo," he replied. "Perhaps the royal family of Helium will treat me with disdain and the princess may forget my name. None of that matters. I have made promises, both to her and to the green girl who accompanies us. It is a matter of honor and I do not intend to break my promises. However, if both girls leave Eo in safety and I see that they reach Helium without any further trouble from you, I will then consider your second promise. But not until all I have spoken has been accomplished." "Then it is agreed, Jasoomian," chuckled the wizard. "Oman and I will perform the task. Ere this night is over the Princess of Helium and her Thark maid will be taken to her home by my flying device and you may return to enter my service when it suits you. Put away your weapon!" ERB Text, ERB Images, John Carter® and Tarzan® are ©Edgar Rice Burroughs, Inc.- All Rights Reserved.